"With the winter months approaching fast my niece and I co-conspired to come up with this warm and comforting soup using 'zoodles' that's easy on the waistline." Heat olive oil in a large pot over medium-high heat. Saute onion, celery, and garlic in hot oil until just tender, about 5 minutes. Pour chicken broth into the pot; add carrots, chicken, basil, oregano, thyme, salt, and pepper. Bring the broth to a boil, reduce heat to medium-low, and simmer mixture until the vegetables are tender, about 20 minutes. 'Zoodles' (zucchini noodles) can be made with a julienne peeler, a mandoline with a julienne blade, or a Spirooli® or Paderno® spiral slicer. I use a Paderno®. Bland. 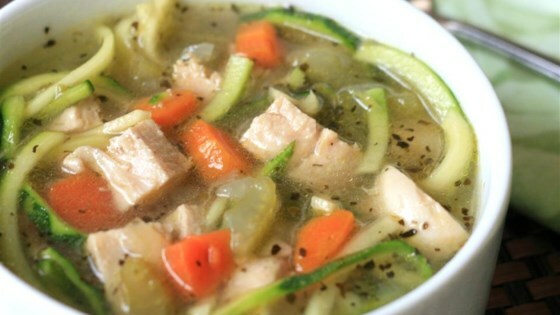 I've made tastier chicken noodle soup and could just use another recipe and substitute zucchini for the noodles.